The Spectrum was among the first mainstream audience home computers in the UK, similar in significance to the Commandore 64 in the USA. The introduction of the ZX Spectrum led to a boom in companies producing software and hardware for the machine, the effects of which are still seen; some credit it as the machine which launched the UK IT industry. The ZX Spectrum was produced by the company Sinclair from 1982 onwards and is the direct follower of the ZX81. Based on this are the Spectrum+ or Spectrum Plus (with 48 KByte working memory), as well as the enhancement Spectrum 128 (with 128 KByte working memory and 3 channel sound chip). 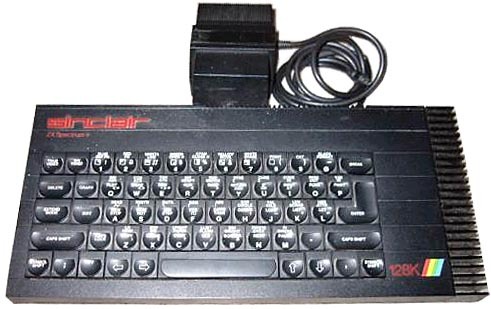 In 1986 the company Sinclair is bought by the competitor Amstrad after the failure of the Sinclair QL. After that only the computers Spectrum +2/+2A (with built-in tape drive) and Spectrum +3 (with built-in 3"-disk drive) are released. From 1981 onwards the Spectrum forerunner ZX81 was built in the production sites of the company Timex in the USA as remittance work. As the production was not used to capacity in 1983, the company Timex produced ZX81 with their own name for the US market without any licence, the models TS1500 and TS2068 (with 48 KByte RAM and cartridge slot) and sold them for lower prices as the original model. The resulting arbitration process at court between Timex and Sinclair raised the publicity of the ZX81 and the spectrum also in the USA, so the production sites were now used to capacity. Sinclair expanded and founded a subsidiary in Frankfurt, Germany and an own production site near Bad Homburg, Germany, in Summer 1984. Furthermore, an own subisidiary had to be founded in the USA, as the company Timex retracted from the computer market at the end of 1984.